We Need Diverse Books is an important grassroots organization in the world of kidlit. They promote literature that reflects diversity and advocate for publishing industry changes. We Need Diverse Books has the following vision: Imagine a world in which all children can see themselves in the pages of a book. As new books are published in 2018, I request them from my library. 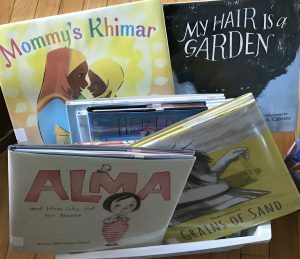 I was thrilled this week when my library basket reflected the We Need Diverse Books goal. Let’s dive in! MOMMY’S KHIMAR by Jamilah Thompkins-Bigelow, illustrated by Ebony Glenn, Salaam Reads (An imprint of Simon & Schuster), 2018. A beautiful celebration of mother and daughter. The khimar acts as a catalyst for imaginary play, a security blanket when Mommy’s away, and a connection to a larger community. MY HAIR IS A GARDEN by Cozbi A. Cabrera, Albert Whitman & Co., 2018. The main character, MacKenzie, runs to a trusted neighbor for advice when she is teased about her hair. Miss Tillie uses her diverse and patiently cultivated garden to show MacKenzie that there are many different kinds of beauty. The book ends with back-matter on caring for black hair. ALMA AND HOW SHE GOT HER NAME by Juana Martinez-Neal, Candlewick Press, 2018. This beautiful book connects the past to the self; the people who came before us to the stories we will tell. It gave me goosebumps. One of my favorites of 2018. GRAINS OF SAND by Sibylle Delacroix, Owlkids Books, 2018. As I was looking through my book basket, I noticed an unexpected theme: How-To books! They are all very different in scope and presentation. Take a look! HOW TO FIND AN ELEPHANT by Kate Banks, pictures by Boris Kulikov, Margaret Ferguson Books (Farrar Straus Giroux), 2017. A conversational guidebook tone pairs with seek-and-find-type illustrations to create an adventure in your own backyard. HOW TO HEAL A BROKEN WING by Bob Graham, Candlewick Press, 2008. Bob Graham shows the city and its indifference in drab grays and browns. But Will is a colorful little boy. And he notices the bird with the broken wing. This sparse tale is an allegory for hope and healing in our broken world. 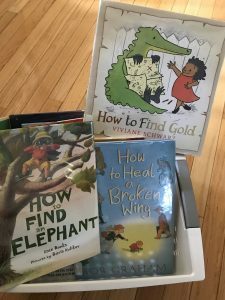 HOW TO FIND GOLD by Viviane Schwarz, Candlewick Press, 2016. This story has the feel of the imaginative, stream-of-consciousness play of two young friends. And can you beat this opening page? “Let’s find gold,” said Anna. “That would be dangerous and difficult,” said Crocodile. Now it’s time for you to go to the library to find your next adventure! Next postThe Secret to an Inspired Writing Life: PLAY!